More of a 2.5 or so but I'm being generous and rounding up because even second-rate Vance is fun to read. 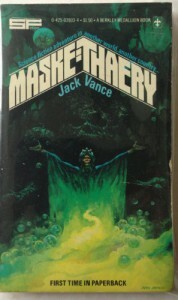 Maske: Thaery is your typical Vance SF novel: The protagonist, Jubal Droad, is smart, cynical and emotionally distant, though underneath there is a passionate, involved person. The action is swift-paced and the villain is contemptuously evil but it's formulaic and not Vance at his best. If you're already a Vance fan, you'll be pleasantly diverted for a few hours. If you're not yet a Vance fan, you should start with one of his classics like The Dying Earth or The Demon Princes so you can see his lyricism and the fun he has with language at their best.